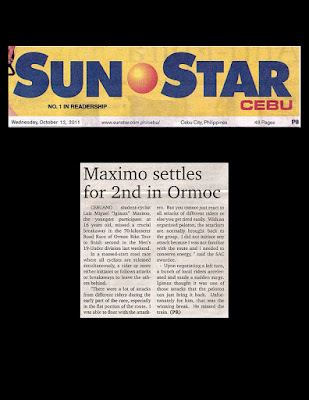 CEBUANO student-cyclist Luis Miguel “Igimax” Maximo, the youngest participant at 16 years old, missed a crucial breakaway in the 70-kilometer Road Race of Ormoc Bike Tour to finish second in the Men’s 19-Under division last weekend. In a massed-start road race where all cyclists are released simultaneously, a rider or more either initiates or follows attacks or breakaways to leave the others behind. “There were a lot of attacks from different riders during the early part of the race, especially in the flat portion of the route. I was able to float with the attackers. But you cannot just react to all attacks of different riders or else you get tired easily. With an organized peloton, the attackers are normally brought back to the group. I did not initiate any attack because I was not familiar with the route and I needed to conserve energy, ” said the SAC awardee.